Personnel: 234, including various support/ logistics personnel; Three, Type 2 – IA crews; Three, Type 1- Interagency Hotshot Crews. 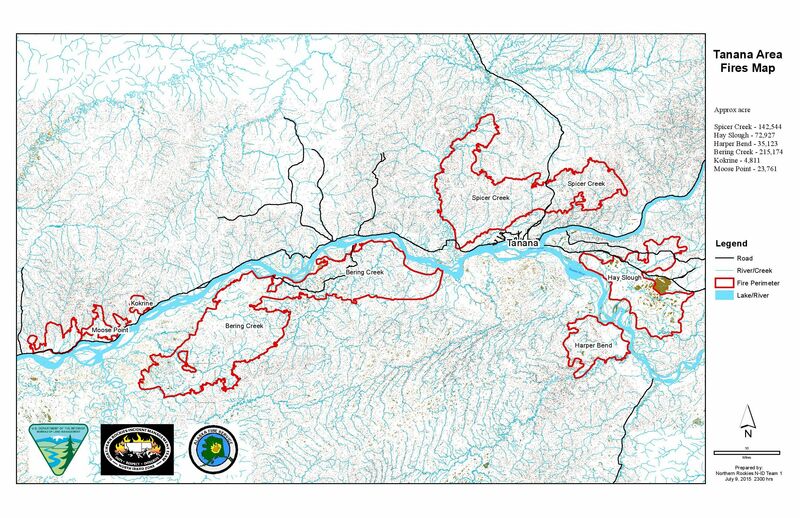 The Spicer Creek, Hay Slough, Harper Bend, Moose Point, Kokrine, Blind River, and Bering Creek fires are all burning on the AFS- Tanana Fire Management Zone. Roger Staats’ North Idaho Incident Management Team (IMT) began managing these fires June 22 and has an Incident Command Post (ICP) located at the Tanana school. Beginning today, however, Staats’ IMT will transition command of the Hay Slough fire to The Rocky Mountain IMT Black, who will also manage the Baker fire, from Manley Hot Springs. The remaining fires will continue to be managed from Tanana School ICP, but beginning July 11, management of those fires will transition to Jim Grant’s Eastern Area Type 2 IMT. Thursday, most of the fires in the Tanana Area again experienced moderate growth. The southwest and northern flanks continued to grow outward and to the west. The fire also continues to back to the south, towards the village of Tanana. The southern end of the combined Spicer Creek/Tozitna Fire measures 49 miles across and the total fire perimeter is approximately 167 miles. The fire is still more than 1 ½ miles north of the nearest inhabited structure along the Site Road. Crews around the community of Tanana (including in the Site Road and Mission Hill areas) continued to improve existing structure protection. A new contingency line from the Site road north of Mission Hill down to mouth of Mission Creek is now complete and crews also installed water handling equipment along that line. Along the Yukon and Tanana rivers moderate fire growth occurred. The Blind River and Bering Creek have merged and will hereafter be referred to as the Bering Creek fire. Two allotments were burned over by the Blind River Fire, but fuel reductions by crews prevented two structures from burning. Crews continue to test water handling facilities, do structure assessments and make structure protection improvements. The Hay Slough fire continues to grow to the north and northeast, also necessitating additional sprinkler installations around structures along the Yukon River. To date, no structures have been lost in any of these fires. Today, crews will continue structure assessments and point protection north and east of Fish Lake and along the Yukon River, near the Hay Slough fire. Beginning today the Hay Slough fire will be managed by the Rocky Mountain IMT Black out of Manley Hot Springs. Crews out of the Tanana ICP will continue assisting with structure protection along the river corridors for this fire. Firefighters will continue to improve fuel breaks and contingency lines around Tanana and outlying structures. Fire crews will continue performing structure point protection along the Tanana and Yukon Rivers, between Harper Bend and Moose Point, as fire conditions necessitate. Special Announcements: A public meeting will be held today, July 10, at noon at the Tanana Community Hall to provide fire information updates. A voluntary evacuation notice remains in effect for the village of Tanana. A dense smoke advisory remains in effect for the Tanana area, with air quality in the unhealthy air quality range. For more info: Please contact Information Officers, Jennifer Costich or Steve Till, Tanana school ICP, at 907-987-9835 or TananaAreaFires2015@gmail.com. Inciweb (http://inciweb.nwcg.gov) also provides fire information. From the Inciweb homepage, select “Spicer Creek” fires from the drop down list at the top right of the page. To obtain fire information regarding the Hay Slough fire, contact Brett Haberstick at 907-672-3202 or ManleyAreaFires@gmail.com To obtain fire information regarding other fires in Alaska, contact the Alaska Joint Information Center at 907-356-5511.